In these warm summer months, I LOVE a good pineapple smoothie. It’s the perfect cool summer treat that I tend to make pretty regularly while I sit outside and soak up the sun. 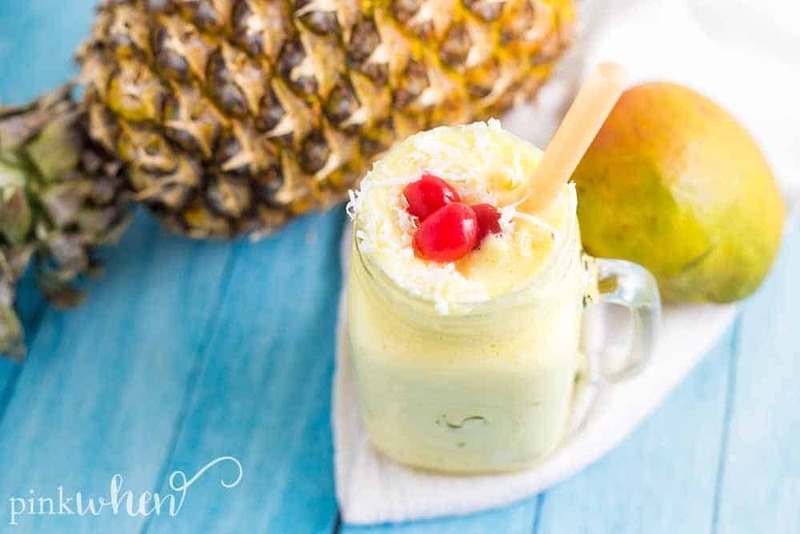 This mango pineapple smoothie is a good one while pineapples are in season – you are going to LOVE this pineapple mango recipe! 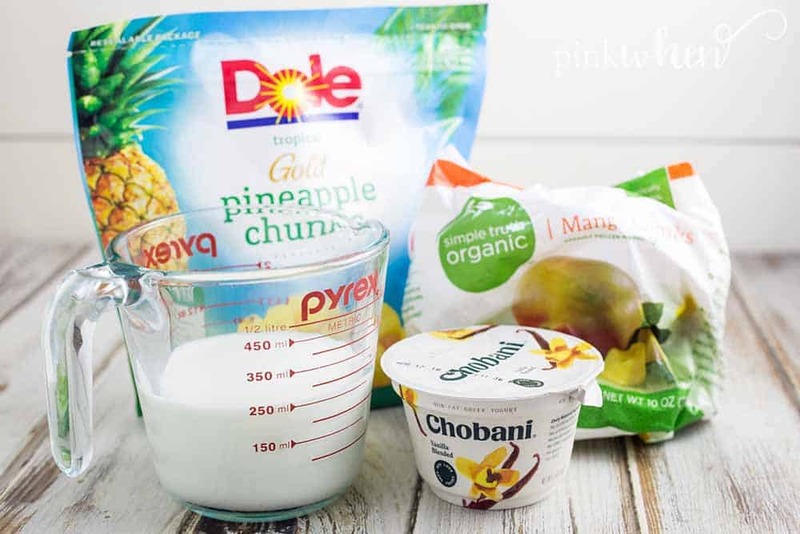 If you have kids that are HUGE smoothie fans, they’ll love this pineapple mango smoothie too! It’s so sweet and delicious, it’s a great way to get liquids into kids while they’re out playing! 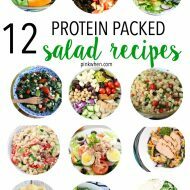 They’ll be sure to guzzle it down quick too, so you might want to make more than one! 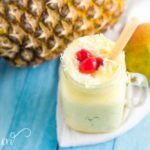 This pineapple smoothie recipe is a great one because it’s just enough to make yourself one while you soak up the sun! 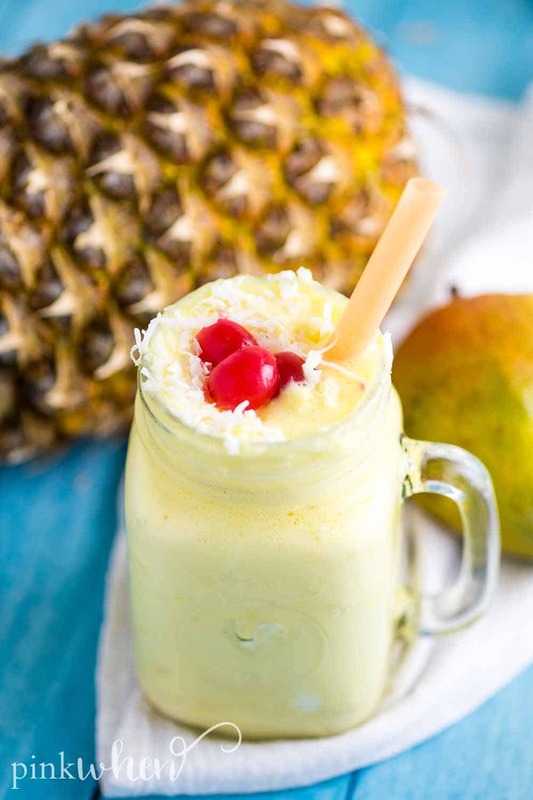 Of course, you can always double this recipe to make more than just one pineapple smoothie! Thankfully, this mango pineapple smoothie is super easy to make! 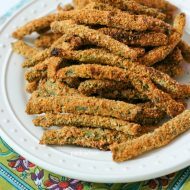 Just throw in the ingredients in a blender and top with a cherry and some coconut. This pineapple mango smoothie really is that easy!! 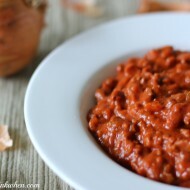 Just scroll down below to get the full recipe. 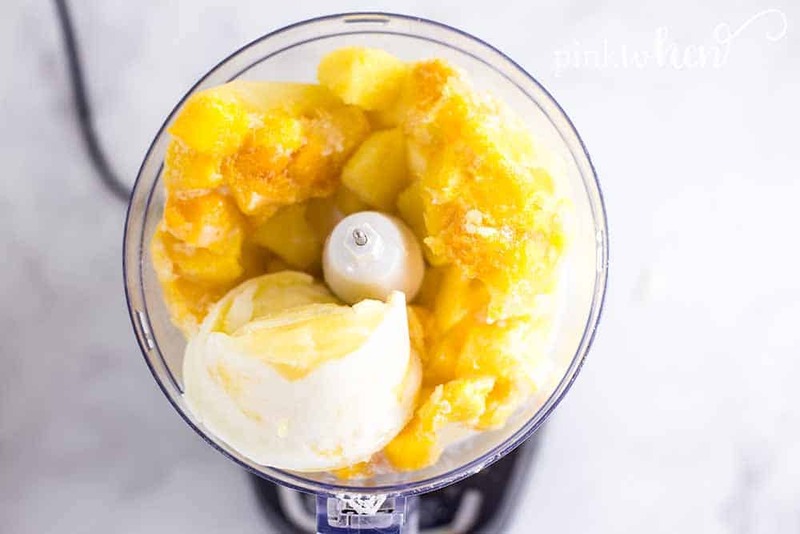 If you love pineapple as much as I do, you might want to adjust the pineapple mango ratio for this pineapple smoothie. It’s already a sweet delicious pineapple mango smoothie, but some prefer a little more pineapple! If you’re making this mango pineapple smoothie for a fun summer party, I love to serve them in mason jars! It makes the pineapple smoothie recipe just a little more fun! 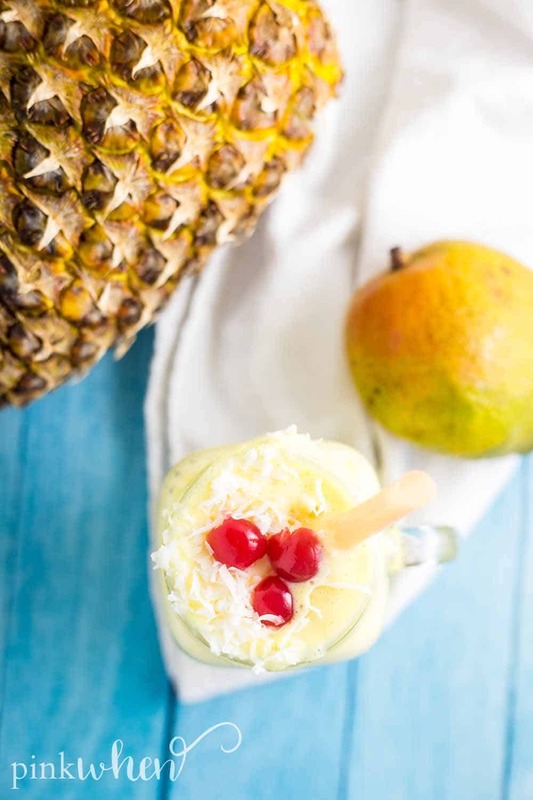 Your guests are going to LOVE this pineapple smoothie recipe and be begging for more. I know you are just dying to get to the mango pineapple smoothie recipe, so I won’t keep you much longer. You are going to love this pineapple mango smoothie!! 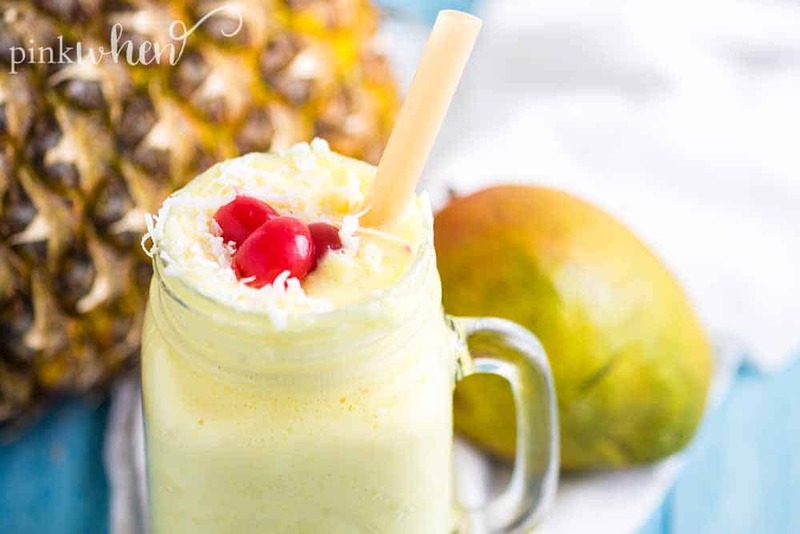 Enjoy this delicious pineapple smoothie recipe! Make sure to let me know how yours turns out. This Mango Pineapple Smoothie recipe is a favorite summer treat. Combine all ingredients in a large blender and blend until smooth. Top with a cherry and coconut flakes before serving. 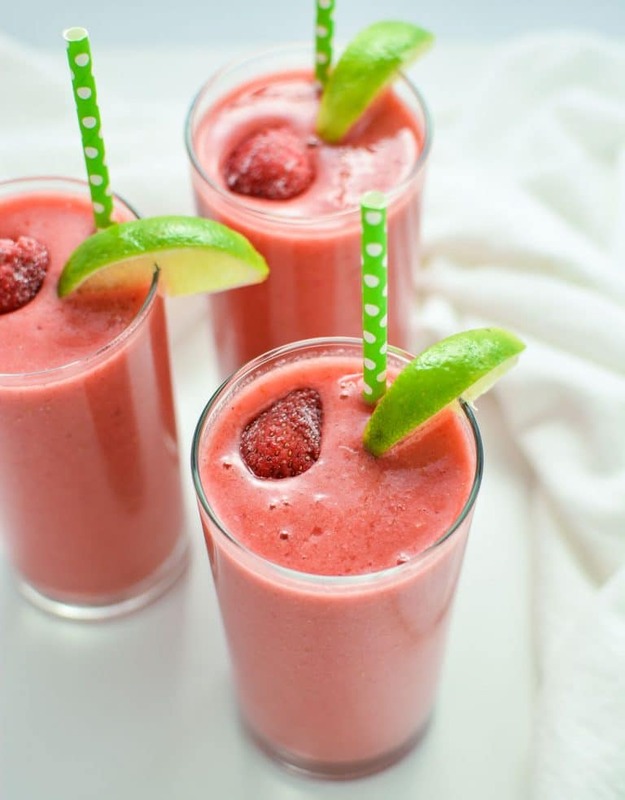 For a thicker smoothie, freeze the yogurt prior to use. If you loved this delicious mango pineapple smoothie recipe as much as I do, why not try this triple berry limeade smoothie? 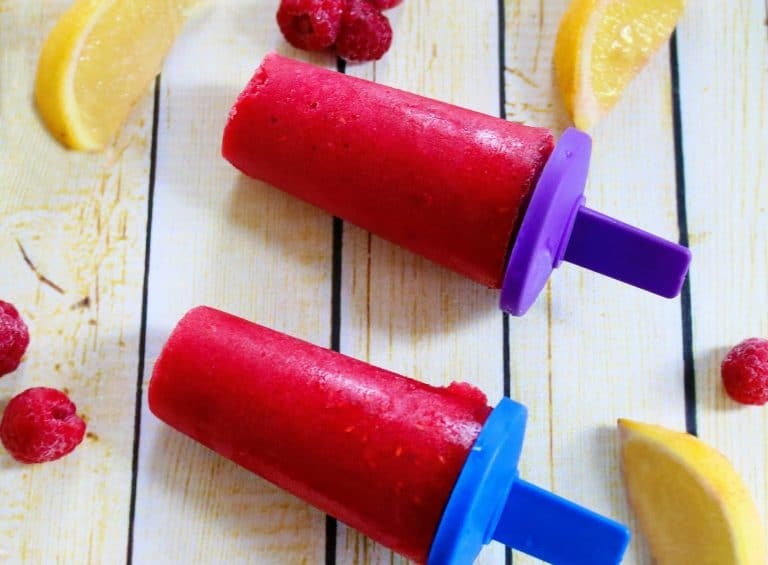 Or these yummy raspberry lemonade ice pops? We buy that same pineapple for frozen smoothie recipes. This looks delicious – like a real summer treat. I can see having it in the winter just to remind myself of summer!